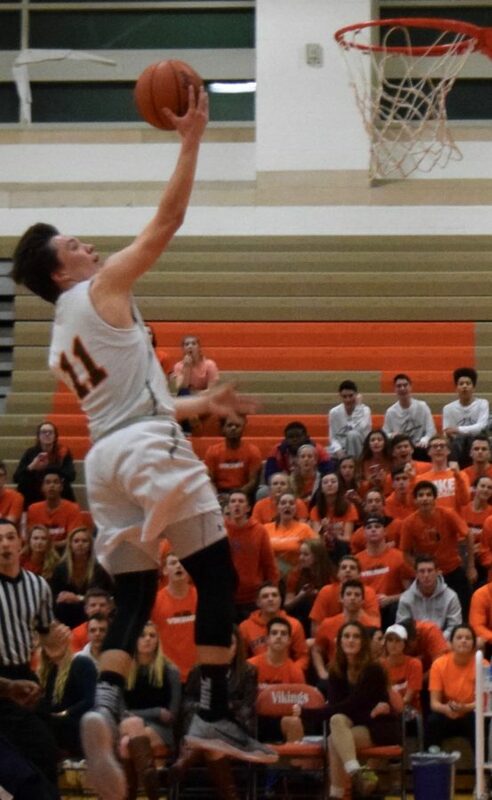 The Perkiomen Valley Vikings soared over the Pottstown Trojans to a 57-54 victory on Tuesday, January 17th. The Vikings’ lead scorers included star player Justin Jaworski (18 points), up and coming sophomore Tyler Strechay (14 points), and senior Sean Owens (14 points). The Trojans’ lead scorers included Brown (17 points), Diamond (12 points), and Wingo (10 points). The Trojans (5-10) tried their hardest to triumph over the Vikings (14-2), but failed to succeed in Tuesday night’s game. This spectacle was also the Vikings’ Senior Night, where five players on the team were honored in a ceremony. PV’s seniors that were honored in this tradition were Jaworski, Owens, Milheim, Lopez, and Downing. The Pottstown Trojans’ head coach, Cal Benfield, was also having a hard time keeping his cool when the refs made some unfair calls. Both the Vikings and the Trojans’ coaches were upset by some of the plays being made as well. A sophomore at Perk Valley and forward on the team, Tyler Strechay, describes how his team played, in his opinion, by saying, “[The team] started out a little slow, but I thought we finished well.” The Vikings fought a hard battle, but it worked out for them in the end. Going into the game, spectators rooting for PV assumed the Vikings would dominate because of their 11-game winning streak, but the Trojans gave them a run for their money. At the end of each quarter, the point difference between the two teams was always less than four. At halftime, the Vikings had a scant lead of 27-23, and for the rest of the game, the point difference stayed this small. The Trojans held their own for the entire game, but they eventually lost the tenacious battle to their opponents. There were many skillful blocks by the Pottstown Trojans, as well as 8 three-pointers by the Vikings and a single three-pointer by the Trojans. The crowds for both teams were upset with the refs because of many calls, which they found unfair. The communication between the players on both teams was insufficient according to the coach of the Vikings Mr. Michael Poysden. “So much of successful teams is based around player to player communication. The guys on the floor have to keep talking to one another and communicate out the ideas and the plays. Communication is what helps us win games,” Coach Poysden commented about his take on what wins games. Indeed, communication is very important when it comes to shooting and scoring points. The players need to know the open and available players, where their opponents are positioned, and how far away the basket is. Some say offense and the amount of points is what will win a team a game, while others believe defense is what saves a team from being dominated. Perkiomen Valley’s momentum for the past 11 games has been a winning streak. Many believe this momentum and enthusiasm is what will propel the Vikings to the playoffs, like last season. All Perkiomen Valley and Pottstown supporters can hope is that better communication, shooting, and defense will be enough to push their team into the Championships! Both Perkiomen Valley and Pottstown need all the help they can get when fighting their way to the PAC Championship.